At age thirty I was a wife and mother to three young children when I sustained a severe whiplash injury, which reversed the natural curve of my cervical spine. AcuRest™ is Patent Pending and manufactured exclusively in the U.S.A.
AcuRest™ is a natural, drug-free answer to sleep related problems. 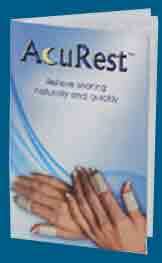 AcuRest™ can promote quality sleep. Quality sleep is a must for health and vitality. 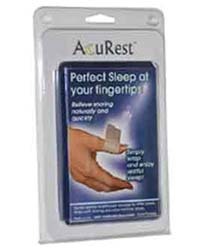 AcuRest™ devices can prevent and relieve snoring, jet lag and other sleep related issues. They treat the effects AND the cause. They are not intended to treat sleep apnea. AcuRest™ devices are made from medical grade, latex free, hypo-allergeni, USA manufactured materials. There is one spare set with each order and together they are designed to last at least 3-4 months (about $2 a month). AcuRest™ have been successfully clinically trialed. About half of all the meridians originate at the fingers and extend to most parts of the body including all areas of the head. When areas of the head and chest becomes congested or blocked, snoring can be the result. Pressing or massaging certain points on the fingers and thumbs, stimulates a release of endorphins and energy that relaxes the muscles involved in snoring. This increase in energy flow or nourishing Chi energy is what occurs when the AcuRest™ devices are applied to the hand at night just before falling asleep. The AcuRest™ devices utilize the science of Reflex Therapy so that when thumb and index fingers are gently stimulated in a specific way three important changes occur. AcuRest™ simply tap into your own body's energy source and direct that energy to the nose, throat and eyes by gentle reflex pressure on the first joint of the thumb and first finger. Is there a way to tell if AcuRest™ are working? Yes, when AcuRest™ are applied correctly you will feel a gentle pulse of energy at the sight of each device. Do not over tighten. Do AcuRest™ devices address the cause of snoring or do I have to use them forever? Permanent relief for snoring can be achieved, in about two to eight months, using the AcuRest™ devices and following the guidelines in the booklet that comes with the AcuRest™ devices. Results do vary depending on the severity of your snoring problem, your lifestyle and other factors. Will everyone feel a gentle pulse when AcuRest™ are applied correctly? No. Persons that have mild to severe neuropathy may not feel the pulse, but that doesn't mean that the devices are not working. Please Note: These statements have not been evaluated by the Food and Drug Administration. This product is not intended to diagnose, treat, cure or prevent any disease including sleep apnea. © 2009 AcuRest™. All Rights Reserved.